Back in the day when I was a competitive skater, we carried stuffies around and we called them our “mascots”. We brought them with us to competitions for good luck, and when we won medals, the mascots got to wear the medals. They were soft, cute, and cuddly, but they definitely did not dispense tissues for us. The earliest days that we see Yuzu carrying a fancy tissue box was in 2009-2010 season, during his junior days. Back then, we simply saw a little miniature Pooh bear lying on top of a covered tissue box. Who knew back then that this would be the start of a great friendship! In the 2010-2011 season, we saw the first transformation of the Pooh tissue box. It was a simple Pooh cover with tissues coming out his nose, and did not appear to be very soft and cuddly. But, it had a useful handle so someone could hold onto it!! Up until then we really didn’t see Yuzu carrying it around much, usually his wonderful coach, Nanami Abe ended up carrying all Yuzu’s things; tissue box, water bottles, towels etc. Fast forward one more year to the 2011-2012 season, and the current Pooh tissue box was born!!! He made his debut along with the Romeo and Juliet program, and has never been separated from Yuzu since! 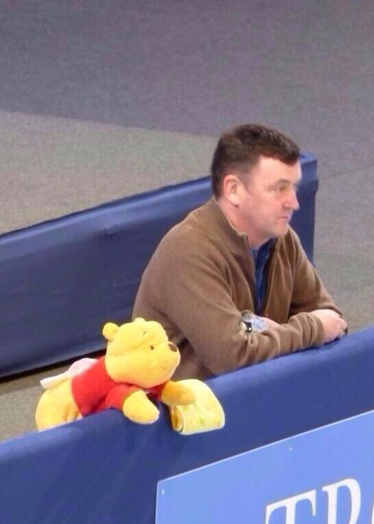 Pooh is ever present at every major competition (except the Olympics where he was forbidden entry due to Olympic brand rules), and he is always there to comfort Yuzu in the Kiss and Cry areas. Pooh has never failed to provide support and encouragement! And, tissues!! 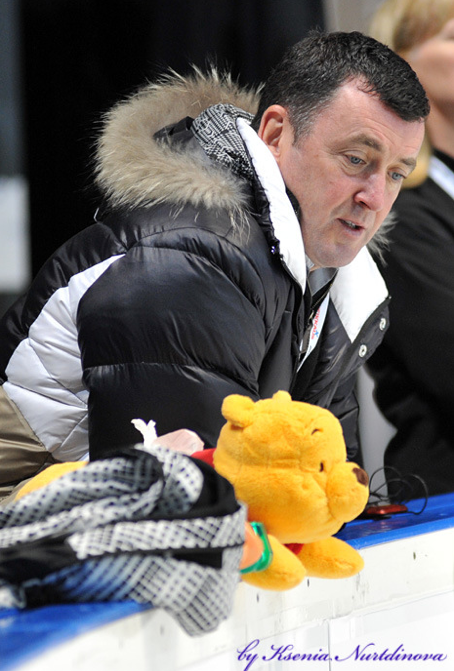 When Yuzu moved his training base to Toronto to train with Brian Orser, he didn’t leave Pooh behind!! When Brian first saw Yuzu with Pooh, he said “I always thought he was that weird kid with the Winnie the pooh doll. Now I’m that kid’s coach…and I have to carry it.” Now, during every competition you will see Pooh close by Brian’s side offering looks of encouragement to Yuzu. Pooh is a very good assistant coach! 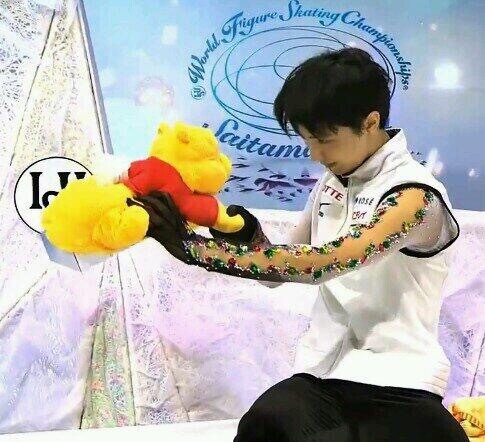 In the Kiss and Cry area, Yuzu always remembers Pooh, and after good performances, he bows and shakes Pooh’s paw. It doesn’t get much more adorable than this! Even after his horrific crash at Cup of China this year, while sitting in the Kiss and Cry area, there are news clips of Yuzu patting Pooh on the head (see above combo picture: bottom right). It is simply too precious for words. The popularity of Yuzu and Pooh has even spawned a dedicated twitter account called @HanyusPooh!! It is an adorable twitter account with over 2,600 followers that tweets the cutest things!!! I highly recommend you check it out on twitter!! So what other impact has Yuzu and Pooh had on the skating world?? The stuffie tissue box craze has multiplied over at the Toronto Cricket Club. Javier Fernandez has a Mickey Mouse tissue box, however I haven’t seen Mickey on the boards during competitions. 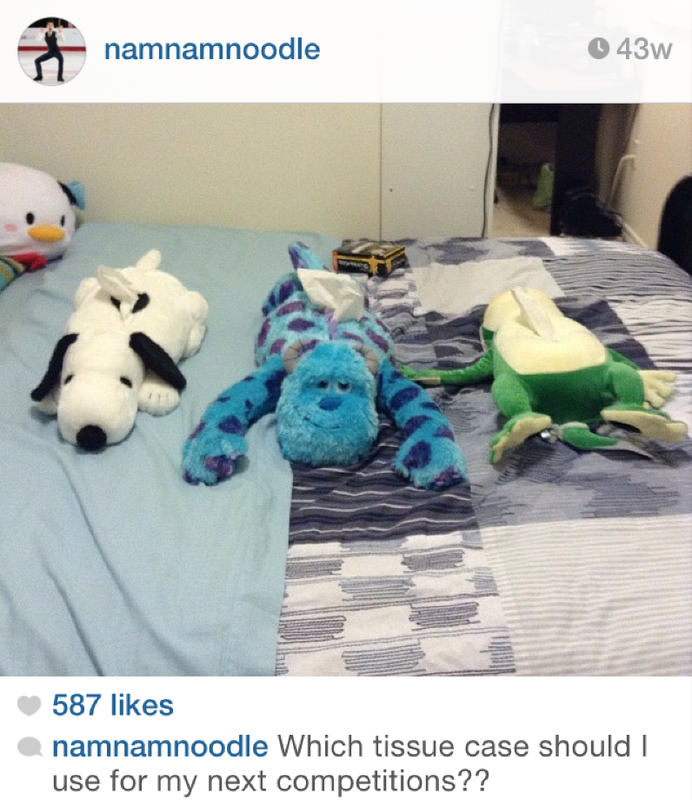 Nam Nguyen has multiple tissue boxes!! I chatted with Nam, and he told me that he received these tissue boxes from his fans. 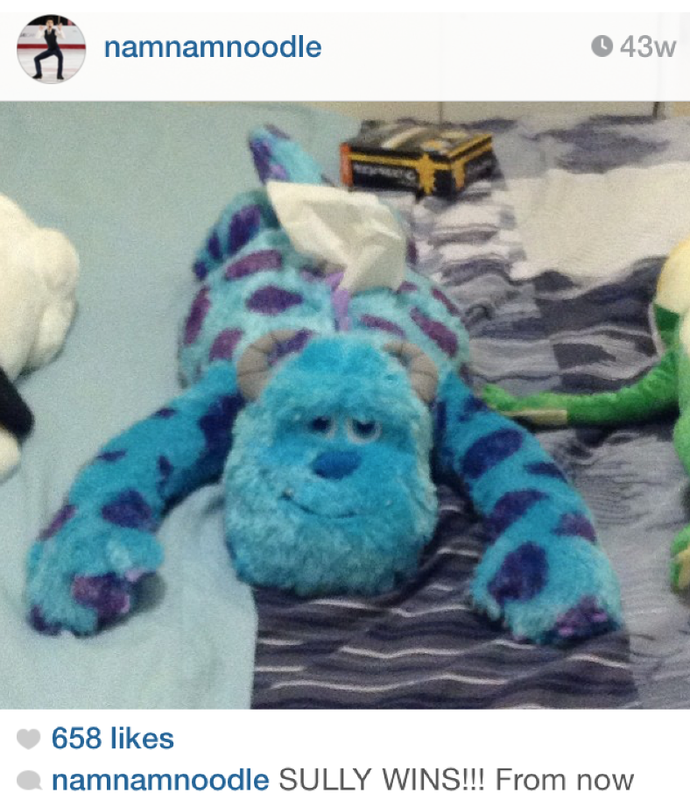 I haven’t seen him bring Sully to any competitions yet even though he indicated he would. Brian must be shaking his head over this! 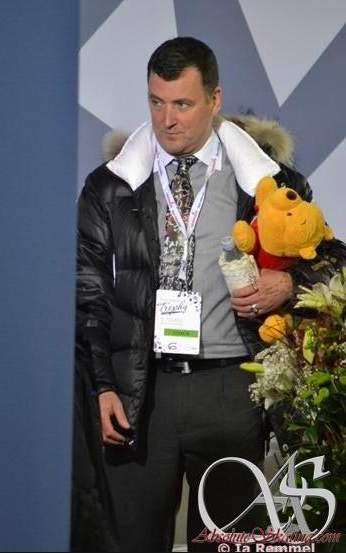 I can’t imagine him carrying 3 stuffie tissue boxes at the World Championships this year. Perhaps he drew the line at Pooh?? All I know is that Brian is a good sport for carrying Pooh around for Yuzu! Disney is getting all of this free publicity and I have said it before, based on the number of Pooh stuffies being thrown onto the ice every time Yuzu skates, and now with Mickey and Sully in the mix, I think Disney should sign Yuzu as a brand ambassador! So, for now, I keep a constant look out for Pooh on the boards whenever I know Yuzu is on the ice and when Pooh is there, I know everything is good with Yuzu. I am a Japanese Yuzu fan in Japan. I love his skating and try watching his play on tv and in competitions and ice shows. I began to go to competitions and ice shows to see Yuzu skating last November. Since then I went to a lot of competitions and some ice shows. I was happy to meet your blog and get to know many new things about Yuzuru. You are a skater. I am over 60 years old and maybe it is safe not to skate now. 30 years ago, however, I tried roller skating for a year. I hope to know a lot of things about Yuzuru. I have got four tickets of ice shows now. I will go to Tokyo, Shizuoka, Osaka, and Kobe. See you soon. Hi Motoko!! Thank you so much for your kind words!! Its so nice that you are able to attend ice shows and competitions!! I will attend some grand prix competitions here in North America and the Worlds in 2016, very excited!!! Thanks again, hope you keep reading!! Hi, I am a 14 year old Yuzu fan!! I have skated for a while now but in the beginning I kept falling but I got encouraged by Yuzuru’s effort and daily practices. I love watching your performances all the time! Even though I live in America, I will always cheer you on!! Good luck in the next competition!! I just got the same pooh tissue box cover from ebay. it’s a little bit pricey since it is said to be a limited edition of Disneyland in Tokyo, but I really like it!!! In your video of Yuzu playing with Pooh, Yuzu is saying something to Pooh. According to a Japanese TV program having someone reading Yuzu’s lips, he was saying　見難いなこいつ　(really hard for this guy to see clearly) because he just took Pooh out from the bag and Pooh’s eyes creased a little. This was most adorable! And I really want to know what Yuzu said to Pooh after he squeezed Pooh and skated out at the free skate of NHK this year. Hi, Im a latin american fan of Yuzuru Hanyu…Greetings from Peru. First of all I want to you say that this article is really nice. it’s a good job about the history of Yuzu’s Pooh *o*… thanks….. Well. In the other hand, I need to know if is possible share this article in a latin page about Yuzuru Hanyu. Yuzu have a lot of fans in Latin America, and for this reason I would like to share a traduction of your nice article whit other Yuzu’s fans . Obviously I will put the credit in the publication. This entry was posted on January 31, 2015 by sportymags in Figure Skating and tagged Yuzuru Hanyu.